……………then the fear of the unknown entered the crews’ minds. Has the fighter seen the aircraft? Will it attack? How many are out there? Is this the decoy while another is forming up to attack from another direction? A 1,000 things would run through the observers mind. What seems like minutes, was often nano seconds. Before…..
Those were the words that all bomber crews hated to hear, the odds were not in their favour. Their aircraft were slower than the fighter, less manoeuvrable, and heavily laden with 1,000s of gallons of petrol, oil and of course the bomb load. Any of which, could easily ignite or explode from a single cannon shell being placed in just the right location. The bombers defences were limited offensively; and while “kills” were claimed by bomber crew gunners, it was more luck that a gunner would have the time and more importantly the range of his guns to be able to fend off a fighter, let alone inflict sufficient damage upon it to force it to break off or better still to be shot down. However, the combination of the gunners reactions and the “corkscrew” manoeuvre were often was enough to give the bomber and its crew a fighting chance or at least cause the fighter to miss its target and may be break off to find another prey. Therefore the theory behind preventing an attack was to “prevent being detected”, or if detected “finish the combat without being seriously damaged. Thus the corkscrew manoeuvre or Barrel Roll was developed. Designed to present the bomber to the fighter in a manner that the fighter could lined up for attack and at the moment the attack began the direction and altitude of the bomber would be violently changed through a series of direction and altitude changes. The pilot (originally cruising at 200-225 mph) opens his throttle and banks at 45 degrees to make a diving turn to port (because the enemy aircraft is on the Port reverse the manoeuver if enemy is on Starboard. ); descending through 1,000 ft in only 6 seconds, the bomber reaches a speed of nearly 300 mph. After the 1,000 ft descent, the pilot pulls the aircraft into a climb, still turning to Port. He reverse the turn, halfway through the climb which has caused his speed to fall sharply, possibly forcing the attacking night fighter to overshoot. Regaining his original altitude, with speed down to 185 mph and still in the Starboard turn, the pilot pushes the aircraft down into another dive. Picking up speed in the dive, he descends through 500 ft before reversing the direction of the turn. If the fighter is still on his tail, he stands by to repeat the manoeuver. The physical effort required by the pilot has been compared with that of an oarsman pulling hard in a boat race. The term barrel roll, by itself, most often refers to a helical roll around a straight flightpath, the purpose of which is to slow the relative forward motion (downrange travel) of the aircraft. This can help a defender to force an attacker, who is usually behind the defender, to fly out in front, called overshooting. This can also help an attacker to prevent an overshoot. This often forces both planes to continue through a series of rolls known as a rolling scissors manoeuver. A barrel roll is also often used to check blind spots while remaining on a steady flightpath. The last second hard turn towards the fighter to maximise the deflection angle and give the gunners a chance for a shot as he passed by. The idea of the day fighter affiliation practices was for the bomber crew to practice their handling and crew coordination and for the fighter to practice his deflection estimation. The initial action was when the gunner called “ready to corkscrew port/starboard” just before the fighter was trying to get into effective minimum range and then use the word “drop” which then required the pilot to haul the throttles back which would cause the aircraft to slow rapidly and suddenly bring the fighter into range and a terrible surprise. At this point the corkscrew would commence under the gunner’s commands. Then the pilot would open the throttles again to where they were previously. They practiced the manouver many times over The Wash with Mustangs who could not get the hang of it at all, and were ‘beaten’ each time. 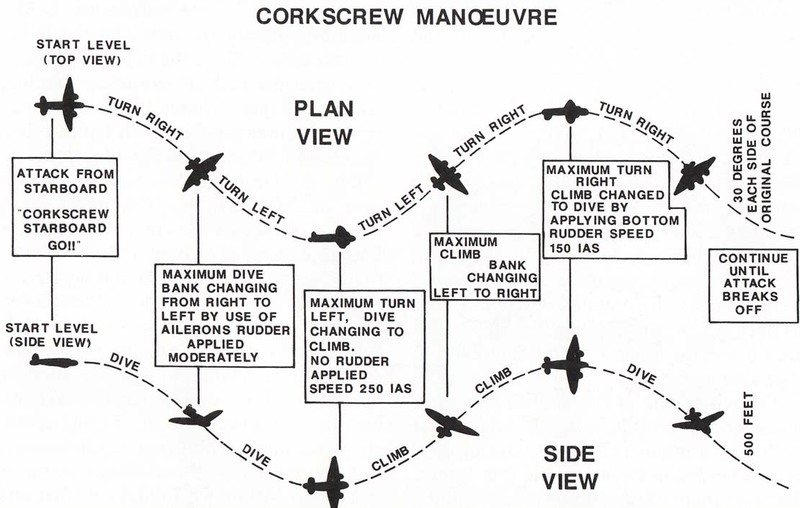 Perhaps different squadrons had slightly different ‘patters’ between the rear gunner and the pilot in going through the corkscrew maneuver; but the patter start with the rear gunner shouting, “Corkscrew port ,Go!” (if the fighter was coming in from the port side; otherwise it would be, “Corkscrew starboard, Go!”,and the patter would change appropriately). “Changing!” as he changed to a diving turn to starboard and went through a similar manouvre with appropriate patter on the other side of his track. From the start of the initial dive until the time he changed to the dive on the other side there would have been a time lapse of about 30 Seconds; his airspeed would have fluctuated from, say 140 knots at which he would have been cruising to a peak of 250 knots at the bottom of the 1st dive and back to about 160 knots. All of his patter would have been significant to the gunners who would change their aim and deflection accordingly through each stage of the manouvre. In practice, particularly at night, the fighter was usually lost in that 1st dive. He would have concluded that there were easier pickings than continuing to tangle with a bomber that was well aware of his presence. Was there an argument against the development of a belly gunner in the Lanc ? Never seem to see it mentioned . Wouldn’t this have been added security for the craft and crew if for instance a JU88 parked itself below as they often did ?